Nagpur: Mankapur police arrested three persons who had attempted to murder their uncle at Akot in Akola district and escaped to Nagpur to dodge police. Cops rounded up the three wanted accused from Tajnagar Slums in Mankapur on Monday evening and later handed them over to Akot police. The DB squad of Mankapur police was on patrol duty and searching for absconding/wanted criminals. Around 6.30 pm on Monday, cops received information that three persons wanted in an attempt to murder case in Akot were hiding in a room in the house of Kayum Khan in Tajnagar Slums. Acting swiftly, the DB squad rushed to the spot and verified the information. After confirmation, the cops knocked the door of room of the said house following which a person opened the door. Cops found total three persons in the room and confronted them with questions. The three men revealed their names as Imam Khan alias Guddu Amir Khan (29), Imran Khan Amir Khan (23) and Kayum Khan, all natives of Ifthekar Plots, Akot in Akola district. The three accused were brought to police station and subjected to interrogation. The three men told cops that they had assaulted their uncle Arif Khan, resident of Akot, on March 17, 2019, with the intention to kill him over a dispute. To dodge the police, the three accused first escaped to Anjangaon Surji in Amaravati district and later hiding in a room in Tajnagar Slums in Nagpur since March 21. On being informed about the arrest, the Akot PSI Gavai informed city police that the three accused were booked for Crime No. 115/2019 under Sections 326, 307, 143, 147, 148, 149 of the IPC. 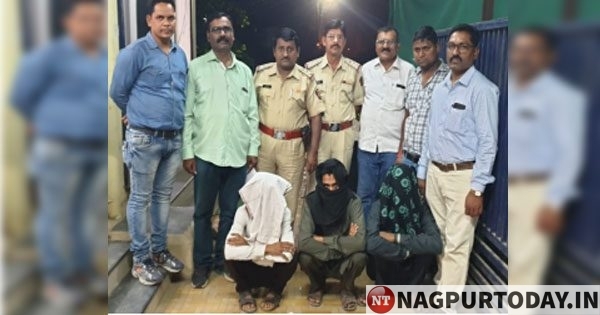 The arrests were made by API A A Fernandes, ASI Dnyaneshwar Shende, NPCs Santosh Rathod, Rajesh Varthi, sepoy Hitesh Farkude, woman NPC Meena Maske under the guidance of DCP Zone 2 Chinmay Pandit, ACP Marathe, Senior PI Vazir Sheikh and PI Matte.